Even if you are good with cars, there are a lot of potential problems you can run into on the road (especially if you travel a lot). Knowing there is always a number you can call and get help in case of an emergency can really give you peace of mind. So here are some of the tops reasons you may want to consider a roadside assistance membership. This post is sponsored by Central Avenue Hyundai. If you know how to change a tire – and you can do it safely – go for it! 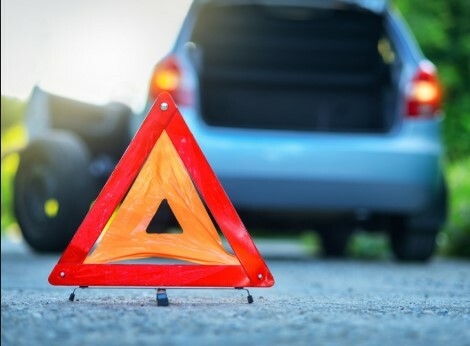 If you don’t know how to , then a roadside assistance program may be right for you. Also there are sometimes problems you can run into when changing your own tire, if a lug nut gets stuck, you are in an unsafe area, or maybe your your spare is flat! Another great reason to have a roadside membership just in case. Though you may have jumper cables in your emergency kit, you 1. need another vehicle to be able to jump you and 2. know how to use them safely. A jump from a reputable company (which is what you will get with your roadside membership) will be safe. Gone are the days of using a wire hanger to open your door when you accidentally lock yourself out of your car. Besides even a lock out, sometimes key fob batteries can die and you won’t be able to get in your vehicle that way as well. If you are able to have someone bring you a new battery, (or your extra set of keys) great! But that isn’t always the case. Sometimes you need professional help. Whether you have roadside assistance or not, be SAFE ALWAYS! Pull your car over to the side of the road or shoulder as soon as it is safe to do so. Turn on your car’s hazard lights and put out your emergency reflector triangles, if you have them, to help alert other drivers. Don’t attempt to repair your vehicle on a busy highway. If you’re able to safely walk to another location, leave a note on the windshield of your car with your phone number, lock your car and call for assistance once you’re in a safe location. If you cannot walk to a safe location, stay in your car with the doors locked and your seat belt fastened. Call for assistance and wait for them to arrive. Roadside Assistance Memberships may not be as expensive as you think – but you do need to know what you are getting. Be sure you have a plan that will give you the coverage you need.